Get the Full StoryDiego De La Hoya began carving his own path towards the top, plus more Alvarez-Golovkin undercard results. Following the theater of Mayweather-McGregor, tonight s showcase event featuring Gennady Golovkin vs. Saul Alvarez seeks to restore competitive balance atop boxing s highest mantle. And appropriately, quick-hitting undercard action presented by Golden Boy and HBO PPV culminated from the T-Mobile Arena in Las Vegas as Joseph Diaz Jr. 25-0, 13 KO virtually shutout replacement opponent Rafael Rivera 25-1-2, 16 KO to become Gary Russell Jr s mandatory challenger. Rivera, 23, received a title-eliminator bid after Diaz Jr s original opponent, top-ten WBC featherweight Jorge Lara, withdrew from the bout for personal reasons. Diaz, a 2012 Olympic Silver Medalist, has gold ambitions on the horizon. 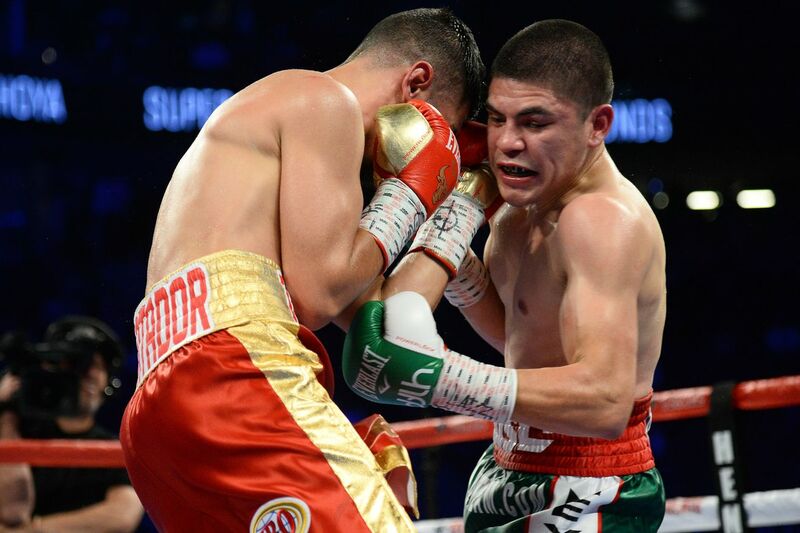 During the undercard's signature matchup, Diego De La Hoya 20-0 10, KO rose from prospect to contender while outclassing ex-world champion Randy Caballero 24-1, 14 KO . De La Hoya, 23, equaled his historic surname behind speedy and accurate combinations to boast a ten-round unanimous decision 100-90, 98-92 twice during the Battle of Coachella. Since a touted pro arrival, when he was introduced to the world as Oscar's fresh-faced younger cousin, De La Hoya has ascended the ranks and now holds NABF 122-pound honors. Conversely, 26-year-old Caballero entered with just two starts since dropping his IBF bantamweight title on the scales in 2014. Pre-fight sources also reported Caballero s right ankle to be functionally diminished. With ranking, honor, and visions of larger paydays at stake, De La Hoya-Caballero represented a true crossroads encounter; forging his own path, Diego now moves forward. The PPV portion of tonight's event opened as 24-year-old Ryan Martin crept past top-ten WBC lightweight Francisco Rojo 20-3, 13 KO to remain unbeaten. In a hotly contested ten-round meeting between fringe contenders, Martin, 20-0, 11 KO used lateral movement and every inch of his spindly 5'11 frame to halt Rojo's eight-fight win streak. However, under constant pressure from Rojo, Martin lost one point in round nine for repeated low punches. Even so, the Cleveland, Ohio native secured enough early rounds to avoid a draw and claim the big-stage majority nod. Official scores read: 98-91 Rojo, 96-93 Martin, 95-94 Martin.